Chookyblue's Secret Santa Christmas Swap (SSCS). will make up for any shortfall in the skills department. This delightful snowman came from Brigitte in 2009. These waves went to Theresa in 2009. 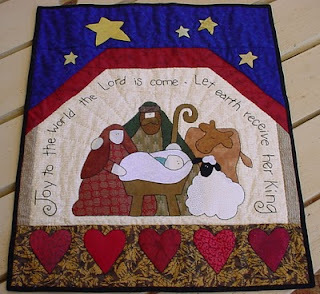 This nativity came from Laura in 2010. This went to Floss in 2010. 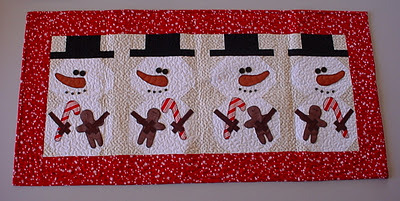 These happy snowmen came from Cheryl in 2011. This is as close to a snowman as I will get here in Perth. These birds flew off to Linda in 2011. This amazing bag came from Karol-Ann in 2012. I get asked about it a lot. This sweet angel went off to Michelle in 2012. There were lots of other nice things sent and received. I only showed you the main gifts. Trawl the blog for more details if you are so inclined. with whatever you want to make! I really like the two seaside pieces you made, and I remember watching you make the last one, the girl with the tree, at the retreat. lovely gifts both sent and received and I also love those seaside pieces, very clever....happy SSCS 2013! 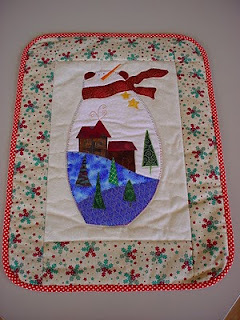 Oh Shari don't feel intimidated by your swap partners ability,you are a gorgeous quilter and stitcher! I know this first hand by the beautiful work you sent to me last year!! Your new partner will be so lucky!! 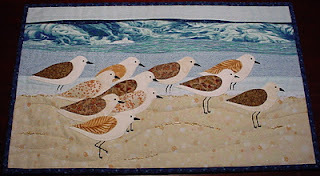 I love your seagull art quilt. Your work looks fabulous! So certainly don't feel intimidated. 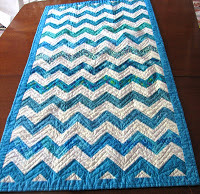 I'm the lucky recipient of the gorgeous wave quilt from 2009. I love this piece. It hangs on my wall where I can see it every day. The colors are so peaceful and yet so reminiscent of the almost daily water polo games I was attending that year! Thank you!